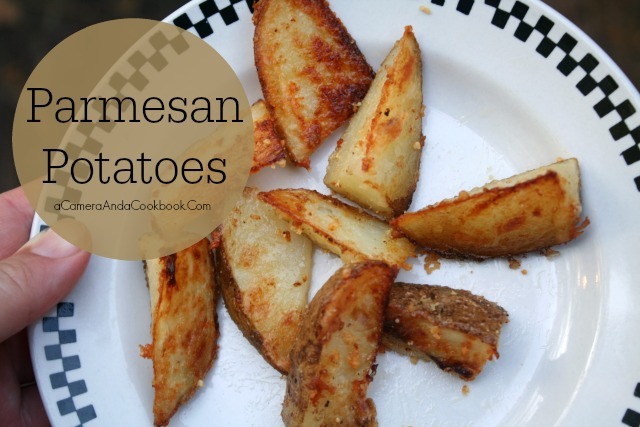 I’m always looking for ways to change up potatoes. 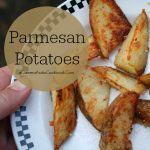 These Parmesan Potatoes are so easy and a family pleaser. 2. Chop potatoes into desired size. The thinner you make them crispier they will get. 3. Put in bowl with olive oil. Make sure all pieces get coded in the oil. 4. Pour 1/2 cup of parmesan cheese and 1 tsp. of garlic salt over the potatoes. Flip to make sure all sides get covered. 5. Place on non-stick cookie sheet and place in oven for 30 minutes or until they reach the crispiness that you desire. 6. Sprinkle other half of parmesan on fries and allow to cool for a couple of minutes before serving. Chop potatoes into desired size. The thinner you make them crispier they will get. Put in bowl with olive oil. Make sure all pieces get coded in the oil. Pour ½ cup of Parmesan cheese and 1 tsp. of garlic salt over the potatoes. Flip to make sure all sides get covered. Place on non-stick cookie sheet and place in oven for 30 minutes or until they reach the crispiness that you desire. Sprinkle other half of Parmesan on fries and allow to cool for a couple of minutes before serving.